Jovian planets have no surfaces as such. As you go down into their atmospheres the weight compressing the gases increases, which requires the pressure to increase by an equal amount. As discussed in The Structure of Planetary Atmospheres (which you should read, at least as far as the discussion of density is concerned), this results in a gradual increase in density. For different planets the rate at which this increase occurs is different. 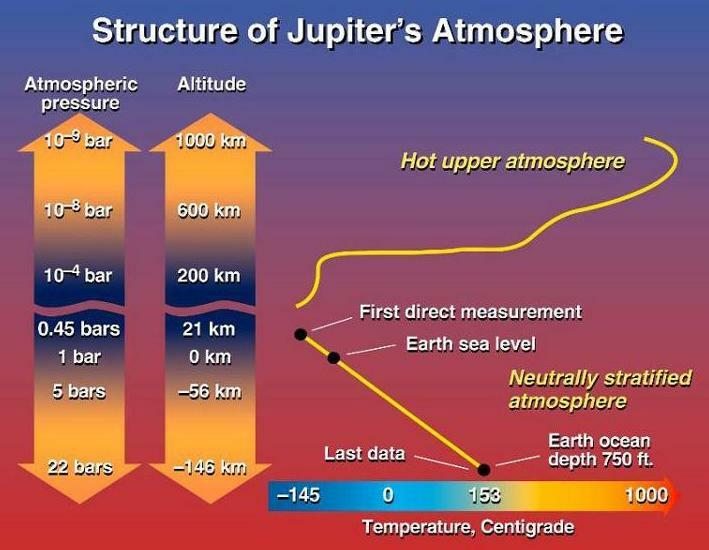 On the Earth the amount of air above you, the weight of that air, the pressure required to hold up that weight, and the density all double in a vertical distance of about 3.2 miles; on Jupiter, as shown in the image below, the distance required for those quantities to double is about 20 kilometers, or about 12 miles. In the 160 km (= 100 miles) that the Galileo probe descended while returning data to Earth the pressure increased by nearly 50 times, from 0.45 bar to 22 bars (1 bar = 1 Earth atmosphere = approximately one ton per square foot), and if the probe had lasted another hundred or two miles the pressure would have increased by another 50 times, to more than 1000 bars (approximately equal to 1000 tons per square foot), and the density of the atmosphere by another 50 times as well. At that rate it can't be more than two or three hundred miles from the visible cloud tops to a depth where the pressure and density are so great that the gas is compressed to the density of a liquid, and becomes essentially indistinguishable from a liquid. That place is the only reasonable definition of the surface for such a "gaseous" planet. Above it the gas acts more like a gas, compressing as the weight pressing down on it increases; below it the gas acts more like a liquid, remaining nearly constant in density and volume (in other words, essentially incompressible), despite the rapidly increasing weight pressing down on it. Technically the material is not a liquid, as it is much hotter than the temperatures at which gases condense to liquids (based on the temperature rise of nearly 300 Kelvins = 535 Fahrenheit degrees = 5 degrees per mile, the temperature at the "surface" must exceed 1000 Fahrenheit degrees and may be almost 1500 degrees). As a result, textbooks typically say that the gaseous exterior of the planet continues downward for thousands of miles, until you reach a point where the pressure is so great that no test of any sort can distinguish gases from liquids; but from a practical point of view the surface is the place where the gas density becomes equal to that of a liquid and the gas compressibility drops to nearly zero; and that is only a few hundred miles beneath the cloud tops, not a few thousand miles. Regardless of how you define the nature of the material, it should be obvious that if the only thing that passes for a "surface" is the place where the gas is compressed to the density of a liquid, there cannot be any surface features, and the part of essay question 3 which deals with the surface features of the planets and their application to the internal structure of the planets does not apply to the Jovian planets. For the Terrestrial planets, a good essay answer should discuss their surface features, the interpretation of their geological history (or lack of it) that we make based on those features, and what we infer about their interiors from that interpretation; but for the Jovian planets you simply need to explain the nature of their surfaces, then state that given that nature, there is no way to infer anything about their internal structure from their "surfaces" even if we could see them (which we can't, because of all the gas lying above them). For Pluto, if we could see the surface features we could approach the topic in the same way as for the Terrestrial planets; but because Pluto is so far away we have no idea what the surface features are like (refer to the discussion in the text and the pictures and captions in the online text). All we can do is tell that some areas are darker and others lighter, and our experience with old maps of Mercury and Mars tells us that such light and dark "features" have nothing (in the case of Mercury) or almost nothing (in the case of Mars) to do with the actual physical structures on their surfaces.